I haven't read Taste, the prequel to this series (it's weird calling it a prequel), so I have no idea what to expect from this book when I started reading it. I know that it's a paranormal romance but that's the extent of it. 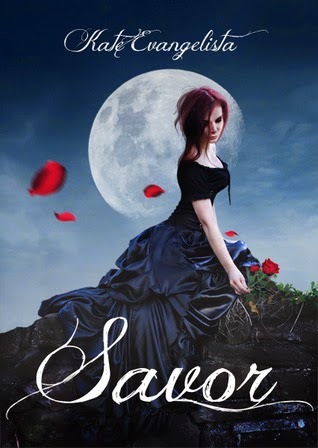 I very much enjoyed Kate Evangelista's new adult book, Romancing the Bookworm, and since I've only ever read contemporary new adult titles I was pretty excited to dive into the world of Savor. Right off the bat, Dakota instantly became my favorite thing about Savor. You immediately see the kind of person she is in the first chapter. She's driven and very kickass. Dakota wears an eye patch, making her depth perception a little off. You can just imagine the kind of passion she has for her craft that she continuously pushes her limits. I like how strong of a person she is... that is until Luka comes in the picture. I don't know much about Luka given that I've only "met" him in Savor but there's something about his mysteriousness that's alluring. Personally, I'm not into the whole rocker vibe but for Luka, I'll make an exception. Dakota describes him so perfectly that I was swooning over him too! I felt Dakota's growing attraction for him as the story went on that I was practically speed reading just to see them get together. The romance? It was frustrating but oh so entertaining. I liked the subtle push and pull between Dakota and Luka. I normally hate it when leads can't just decide to be together but somehow the vagueness in Dakota and Luka's relationship works. If anything, it's makes them even more interesting. You get that excitement from not knowing where they really stand. I like that little by little you get a glimpse of Luka's growing feelings for Dakota. Dakota's month long stay in Lunar Manor definitely complicated things. Of course they were unsure of their relationship or whatever you call it because Dakota would eventually leave and Vicious would go on being the world-renowned band that they are. But they both made the most of what time they had left. It was a crazy little romance but oddly enough, I liked it. Other parts of the book that I liked were the music and the photography. I liked that Evangelista really committed to making art in the form of music and photography a big part of the book. The descriptions of Vicious songs and music videos were detailed. Dakota's photos (and the photo shoots) were also described vividly. I really felt connected to the characters and their passion. It was almost like being with them. I especially had fun reading parts were Dakota would take pictures of each band member for her project. I like the creativity behind every photo shoot and how well the characters were represented. I only met them in Savor but whenever I read more about them in their element, I feel like I know them well enough. Now my only complaint about Savor is that I couldn't tell that this is actually a paranormal book right up until the last part. I mean, yeah, you could tell something freaky is going on because a) Vicious is a band that dominates the charts (top ten songs - all theirs! ), b) they live in a "manor" where the similar looking gray-haired help calls them "master" and c) Luka did this weird get-away-from-me thing when he was making out with Dakota and you just know it's not because he didn't want her. While I was enjoying the story though, I kept waiting for the "big reveal" where Dakota goes, I know what you are ala Bella Swan (okay maybe less pathetic). It was bothering me that I couldn't tell what the heck was going on with the band or what kind of voodoo they were working. I felt like I was missing out on something and I think it's because I didn't read Taste beforehand. Other than that though, the story's good. It's entertaining and well-written. 4 stars! When Kate Evangelista was told she had a knack for writing stories, she did the next best thing: entered medical school. 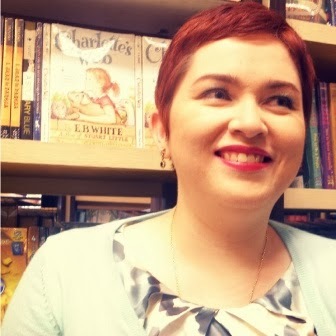 After realizing she wasn't going to be the next Doogie Howser, M.D., Kate wandered into the Literature department of her university and never looked back. Today, she is in possession of a piece of paper that says to the world she owns a Literature degree. To make matters worse, she took Master's courses in creative writing. In the end, she realized to be a writer, none of what she had mattered. What really mattered? Writing. Plain and simple, honest to God, sitting in front of her computer, writing. Today, she lives in the Philippines and writes full time.